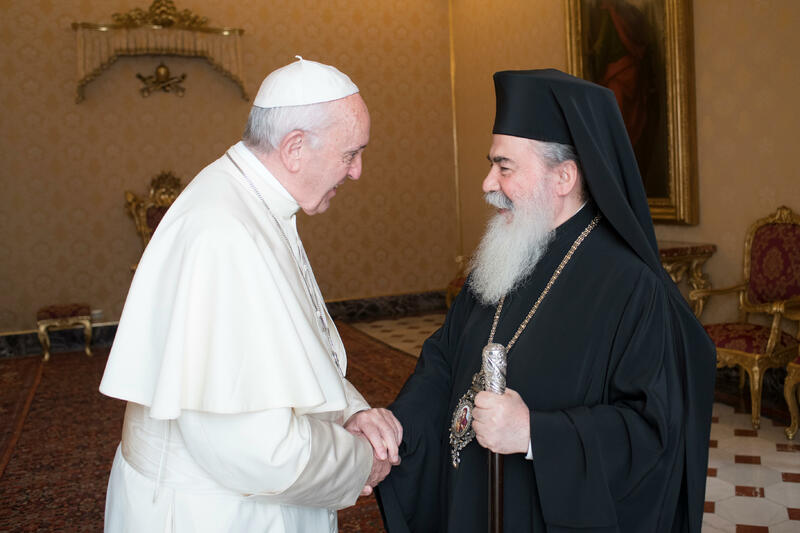 Pope Francis on October 23, 2017, received Beatitude Theophilos III, Greek Orthodox Patriarch of Jerusalem. With great joy I welcome all of you to Rome. I reciprocate with gratitude and fraternal affection the warm welcome Your Beatitude offered me during my visit to Jerusalem. Still fresh in my mind is the attentiveness with which you accompanied Ecumenical Patriarch Bartholomew and myself in the Basilica that preserves the places of the Lord’s crucifixion, burial and Resurrection. I am still moved when I think of our moment of prayer in the aedicule of the empty Tomb, and I again express my pleasure at the restoration of that most holy place. It has not simply secured the integrity of a historical monument, but also enabled the empty tomb to continue to testify that: “He has risen, he is not here; see the place where they laid him” (Mk 16:6). I rejoice that the Greek Orthodox Patriarchate of Jerusalem, the Armenian Patriarchate of Jerusalem and the Franciscan Custody of the Holy Land have worked together in such harmony on this project, as they also did for the Basilica of the Nativity in Bethlehem. I thank Your Beatitude very much for your own efforts in this regard. Our meeting allows me to renew my closeness to all those suffering from the conflicts that for decades have beset the Holy Land. The uncertainty of the situation and the lack of understanding between the parties continue to create insecurity, the restriction of fundamental rights, and the flight of many people from their land. I invoke God’s help in this, and I ask all those involved to intensify their efforts to achieve a stable peace based on justice and recognition of the rights of all. To this end, any kind of violence, discrimination or displays of intolerance against Jewish, Christian and Muslim worshipers, or places of worship, must be firmly rejected. The Holy City, whose Status Quo must be defended and preserved, ought to be a place where all can live together peaceably; otherwise, the endless spiral of suffering will continue for all. I would offer a particular greeting to the members of the various Christian communities in the Holy Land. It is my hope that they will continue to be recognized as an integral part of society and that, as citizens and believers in their own right, they can continue tirelessly to contribute to the common good and the growth of peace, striving to further reconciliation and concord. This contribution will be the more effective to the extent that there is harmony between the regions’s different Churches. Particularly important in this regard would be increased cooperation in supporting Christian families and young people, so that they will not be forced to leave their land. By working together in this delicate area, the faithful of different confessions will also be able to grow in mutual knowledge and fraternal relations. Here I would reaffirm my heartfelt desire and commitment to progress on our way to full unity, in obedience to Jesus’ fervent prayer in the Cenacle “that they may all be one… so that the world may believe” (Jn 17:21). I know that past wounds continue to affect the memory of many people. It is not possible to change the past, but, without forgetting grave failures of charity over the centuries, let us look to a future of full reconciliation and fraternal communion, and take up the work before us, as the Lord desires. Not to do so today would be an even graver fault; it would be to disregard both the urgent call of Christ and the signs of the times sown by the Spirit along the Church’s path. Inspired by the same Spirit, may we not let the memory of times marked by lack of communication or mutual accusations, or present difficulties and uncertainty about the future, prevent us from walking together towards visible unity, nor hinder us from praying and working together to proclaim the Gospel and to serve those in need. In this regard, the ongoing theological dialogue between Catholics and Orthodox, in which the Greek Orthodox Patriarchate of Jerusalem participates actively and constructively, is a comforting sign of hope on our journey. How good it would be to say of Catholics and Orthodox living in Jerusalem what the Evangelist Luke said of the first Christian community: “All who believed were together… one heart and soul” (Acts 2:44; 4:32). Your Beatitude, I thank you and the distinguished members of your entourage most cordially for your visit. I reaffirm my closeness to our Christian brothers and sisters in the Holy Land, and my affection for our friends of the other great religions who live there. I hope and pray that the day of a stable and lasting peace for all will soon come. “Pray for the peace of Jerusalem! May they prosper who love you! […] For my brethren and companions’ sake I will say, ‘peace be within you!’” (Ps 122: 6-8).